Even in the times of cheap terabytes a final truth remains: Sooner or later every hard disk will near capacity. But there is help! TreeSize Free tells you where precious disk space has gone. 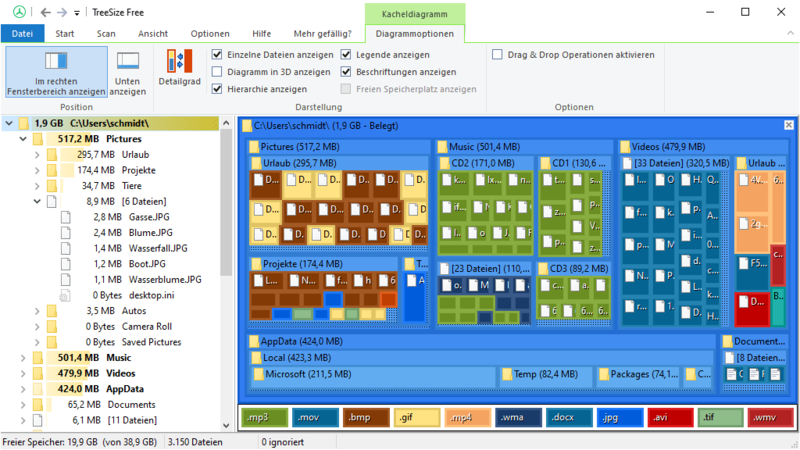 Use the treemap to keep an eye on your disk space. The freeware can be started from the context menu of a folder or drive and shows you the size of this folder, including its subfolders in an Explorer-like fashion. Large folders can be identified at a glance thanks to the gradient bar displayed in the background. All scan results can be drilled down to file level and filters, e.g. for files of a certain type, can be applied. TreeSize Free can display the NTFS compression rate and apply the NTFS compression to directory branches.